Not when it comes to sparkle balls, Camille. That ball belongs to Bean. Don't let her catch you with it. She is just soooooo cute! She really does look like a white siberian tiger! Does Camille have a sparkle ball death wish? Kittens never seem to understand the danger of pushing the Bean's buttons. Hey Bean, Camille looks really really cute with the sparkle ball though. Such a cutie and a beauty! 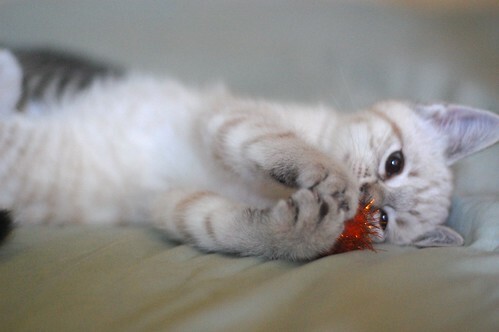 Such a cutie...so intent on the toy. Watch out Camille...don't get any drool on Miss Bean's sparkle ball. My heart belongs to Camille. Are Camille's stripes getting stripey-er? But be careful with that sparkle ball, girl. Nope, it belongs to Camille ~ ALL toys belong to cats! Nuff said! Oh, Camille! Be careful, girlfriend! Charlene is a kind and patient cat, but NOT when it has to do with her tail being attacked, being nursed on, and ESPECIALLY NOT WHEN IT HAS TO DO WITH HAVING HER SPARKLE BALLS PURLOINED!!! If Charlene comes around, stand up quickly and back away from the sparkleball! nooo - nine tenths of the PAW!